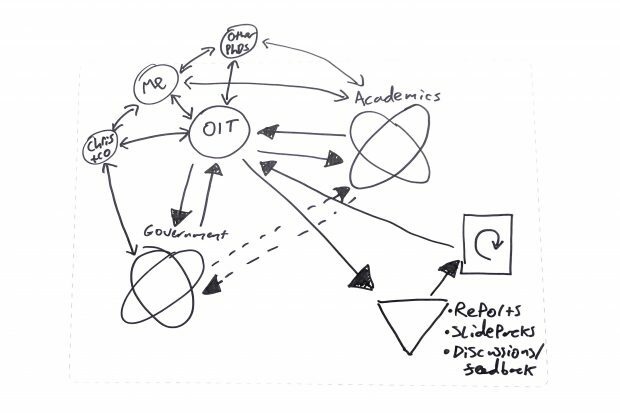 The Open Innovation Team (OIT) is a great example of disruptive innovation in government: in 2016 they crafted a completely new way of securing resources, creating services of value to multiple departments, and at the same time building new networks that enable more academics to engage with more policy makers more often. Crucially, at the same time as delivering these more specific outcomes, the team began an important process of legitimising itself as a valuable, permanent and increasingly impactful part of the UK government. The challenge for us was evaluating this apparent success, a challenge well known in open innovation settings. When you catalyse activity across a diverse range of partners and projects not under your direct control, keeping track of progress and performance is very difficult. If your team is small, entrepreneurial and busy this becomes even more difficult: the demands of success mean you cannot divert scarce resources to chasing up data from disparate organisations. It is therefore very important to pause, reflect, and look deeply not only at the performance of individual projects but also the evolving nature of your work, your business model, the stakeholders who really matter, and the management challenges ahead as you seek to grow and deliver increasing benefits to government. To find out more, please visit the Open Valuation website where you can access the evaluation of the OIT.